I have fallen into the rabbit hole of deep dives into Final Fantasy XV lore and I don’t think I’ll ever escape. Please send help. As many of you have already discovered, Final Fantasy XV has a secret dungeon called the Pitioss Ruins that’s one of the best things in the game. It’s very different from anything else in Final Fantasy XV. There’s no combat, only puzzles and platforming, and you go through the whole dungeon without any of your party members. The game doesn’t try to explain why Pitioss Ruins exists, what any of the surreal statues and passageways mean, or why you have to jump your way through a giant demonic wall en route to uncovering the dungeon’s secrets. It’s reminiscent of a Destiny raid in that it plays by different rules than anything else in the game, and it never quite explains itself. It’s fantastic. The story in Pitioss, as said in our last post is a tale told through symbolism. It is Ifrit’s masterpiece crafted to tell the tale of how he tried to save Eos, Goddess of the Dawn, by travelling into the Underworld to free her from her imprisonment. Let us stress here that Pitioss is NOT where these events actually occurred. 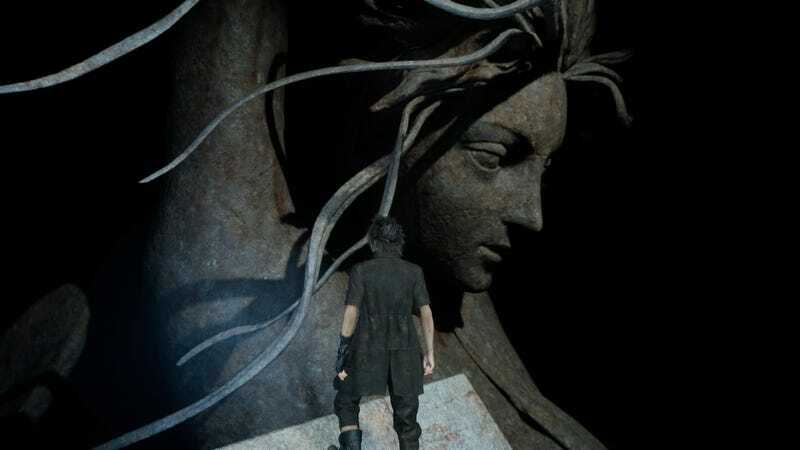 Pitioss is literally a Greek tragedy stage play set up by Ifrit himself to tell his epic tale to a future Lucian king & memorialize his beloved, Eos. The Greeks invented stage play with the Greek Tragedies, and this game is heavy with Greek & Roman mythology. It fits the tone of FFXV perfectly. Ifrit is fickle as fire, emotional, and a romantic. He could have just written a book & hidden it somewhere. But no. He’s artistic. He wants to lay his tale out in a very visual & symbolic way, down to the last detail. This explains the heavy use of symbolism throughout Pitioss Ruins. We realized that if the statues, puzzles, and events in Pitioss are symbolic…then the items strewn about the dungeon and details on objects must be as well. We slowly went through Pitioss and studied every item and what we know they mean. Paying attention to even the smallest of details in Pitioss truly opened the story to us in a completely new way. In short—and really, you should read this entire theory—perona77 argues that Pitioss tells the story of Ifrit’s love for the goddess Eos. In an elaborately constructed argument that involves old-school Final Fantasy references, Greek mythology, and tragic Shakespearean pathos, perona77 proposes the idea that Ifrit was actually a good guy, not the nasty villain he appears to be in Final Fantasy XV. In fact, Ifrit unintentionally prevented the world from being destroyed—despite the fact that he spread the “star scourage” plague that is referenced so often in the game. The soul of the star is in the crystal. The sun is a star. Eos’ soul is in the crystal. This is why it can restore the Dawn. The crystal contains a small shred of the goodness and light that once was Eos. Ifrit saved her just in time, before the last of her light was extinguished. If he had not gotten Eos’ out when he did, and purified her body with the Pyre, her light would’ve gone out, bringing eternal night. Burning her on the Pyre spread the star scourge into the air, but it was a necessary evil. But how was the Crystal retrieved?? Let’s look at Ifrit during the Citadel battle. After Ifrit transferred his soul to his nearby messenger, he must have returned to the Pyre after the flames died down. He must’ve cut open her heart and reached inside to retrieve the Crystal. That is why he has burns on half of his body. Her burning, crystalized heart was still that hot! At some point, Bahamut must’ve stolen the Crystal from him. Also, at some point after his first death and retrieving the crystal from Eos’ heart, Ifrit in his messenger’s body must have built Pitioss ruins. At the cost of his life, at the cost of becoming a Betrayer, at the cost of spreading star scourge unto the world. If Ifrit had not saved Eos when he did, the last of her light would’ve been extinguished, and there never would of been another dawn! Ifrit is the hero of this game! Not the Lucian Kings, not The Oracles, and certainly not the other Astrals! Ifrit unintentionally save the world with his act of pure love. Go read the whole thing. It might not be what Hajime Tabata and crew actually intended, but it sure is brilliant.